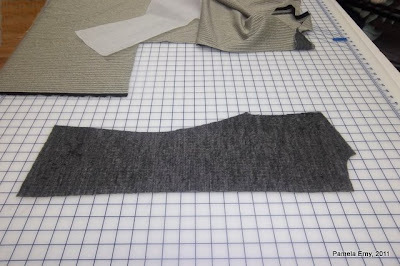 Block Fusing is a method that many modern tailors and home-sewists use to apply interfacing to fashion fabric yardage before the pattern pieces are cut out. 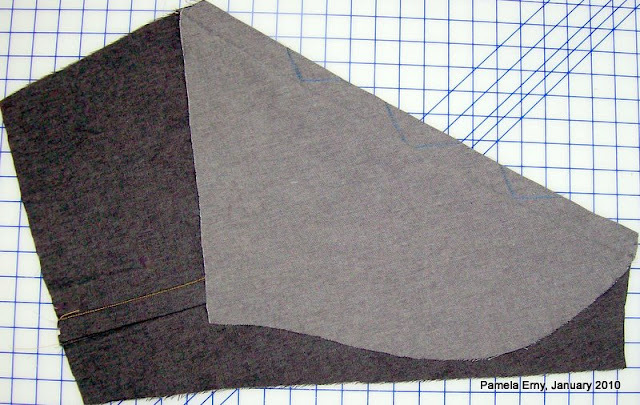 Have you ever struggled keeping the interfacing layer from slipping off-grain as you attempt to fuse it to your fabric yardage? 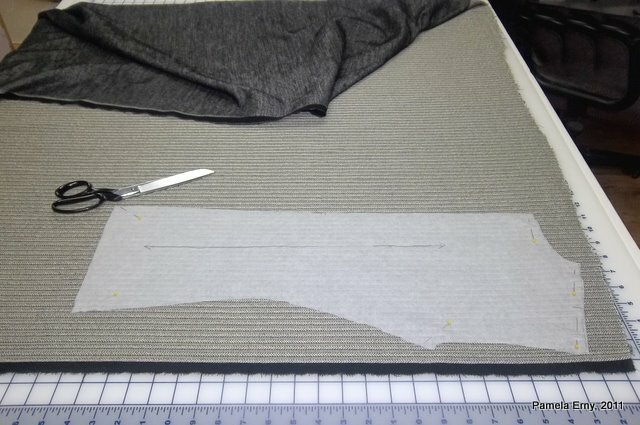 Next time, try this fast, easy, and accurate method that I learned from a Master Tailor, called "SPOT-FUSING"...And it can be done right on your cutting table! First, we need to prepare the surface of the table. 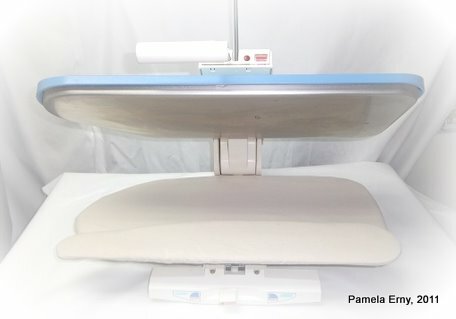 The photo above shows my cutting table covered with 2 layers of HEAVY weight muslin (from Gorgeous Fabrics), and one layer of very thick wool (a heavy wool blanket will work as well..I just happen to have felted wool yardage that I use for this technique). It is VERY important that these layers be smooth and free of wrinkles, so thoroughly smooth them out before proceeding. Next, lay out your fashion fabric on top of your "padded" table, WRONG side UP...making SURE it is smooth. What you see in the photo above is 3 yards of 60" wide silk/wool suiting fabric. 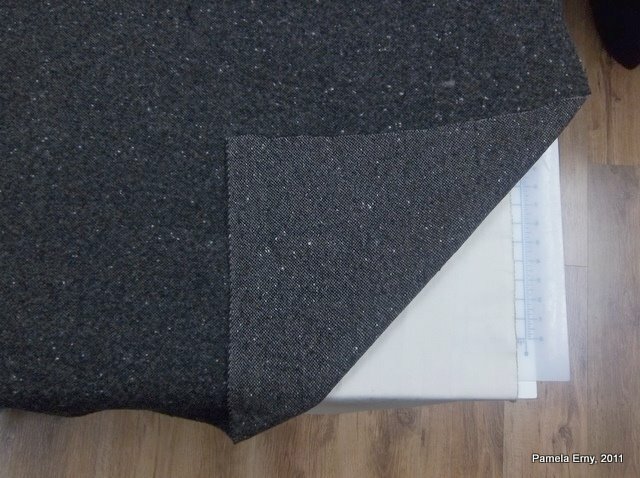 The cut edge of the fabric is to the left, with the rest of the yardage hanging off the right side of my table. There is no need for weights to hold the fabric in place...the under-layer of wool holds it nicely. 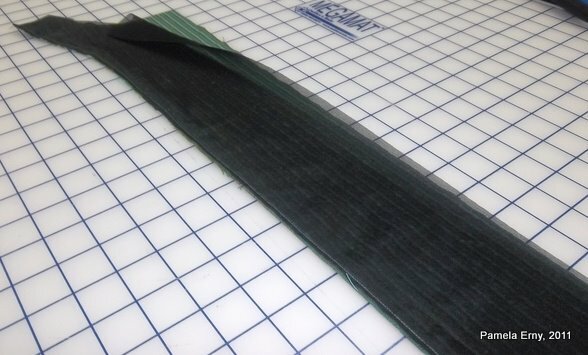 But if you need to, weights can be placed along the top edge (in the above photo, the (top) cut edge is to the left). Now lay your Interfacing FUSIBLE Side DOWN on the (wrong side) of the fashion fabric, making sure it is smooth and on grain. 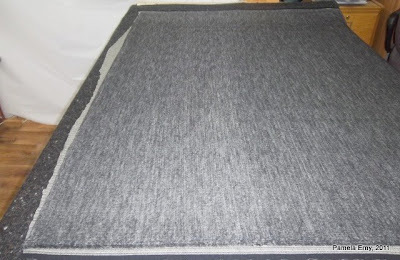 I am using Charcoal-Black Pro-Weft Supreme Light Interfacing, one of my custom-milled professional grade interfacings available exclusively at Fashion Sewing Supply. 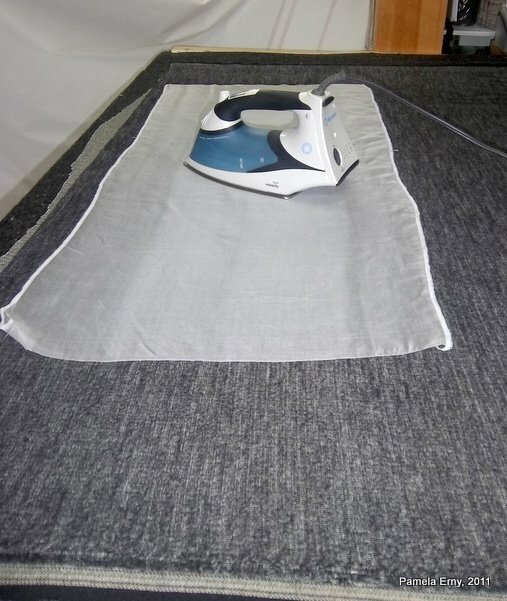 This is where the Spot-Fusing happens :) USING a thin PRESS CLOTH, and your steam iron set to a low-wool setting, start moving your iron over the interfacing with an UP and DOWN motion. 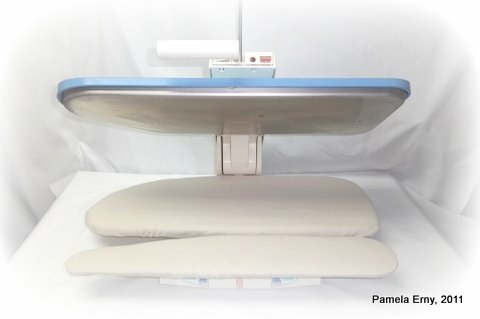 DO NOT slide the iron, just move it all over the interfacing, pressing with steam for a few seconds, picking up the iron, moving it over an inch or so, and steam pressing again for a few seconds. 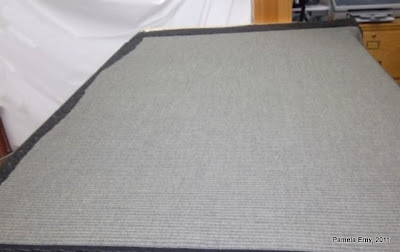 I start pressing in the middle along one edge, and spot-press to one side until I reach the edge of the yardage, then begin again in the middle and work towards the other edge. I keep repeating this, working my way down and along the yardage, until all the yardage on my table has had the interfacing "tacked" (SPOT FUSED) down. Then I carefully pull the next section of fabric + unfused interfacing so that it covers the table, making sure that all is smooth and on-grain...then repeat the Spot-Fusing process again until all the fashion fabric yardage has been Spot-Fused. I can Spot Fuse a few yards of 60" fabric in about 5-10 minutes. Please note that the object here is to just tack the interfacing to the fabric...NOT to fuse it completely..that comes later. 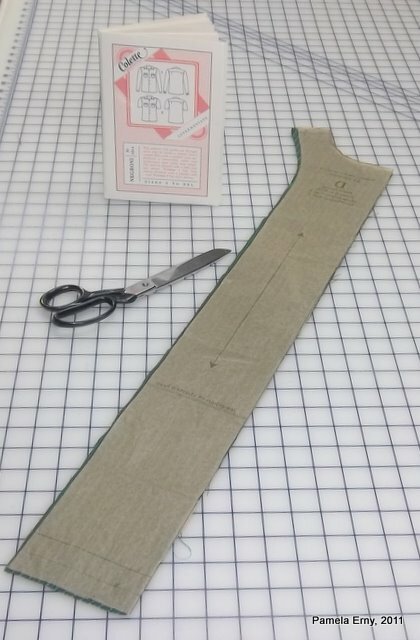 After removing the Muslin+Wool "padding" from your cutting surface, carefully lay your Spot-Fused fabric yardage right side up, lay out your pattern pieces and cut them out. NOW is the time when we take our garment pieces to our "official" pressing surface (your Ironing Board or ClamShell Press), and "finish the fuse"...following the complete fusing instructions that come with your interfacing. An Elna Press, at least 10 years old and only used about ten times ! 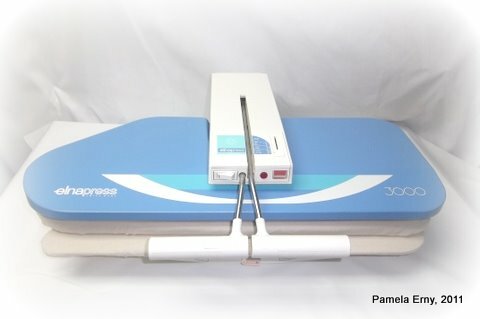 And not just any press, but one with a Sleeve Board ! Oh happy day ! I missed my commercial steam press so much when it died last year. But this one will be a dandy stand-in until I can acquire another commercial press. Now that is just too cool...no pun intended :) And will save me so much time when pressing shirts, especially the final press before one of my custom shirts gets shipped to a client ! 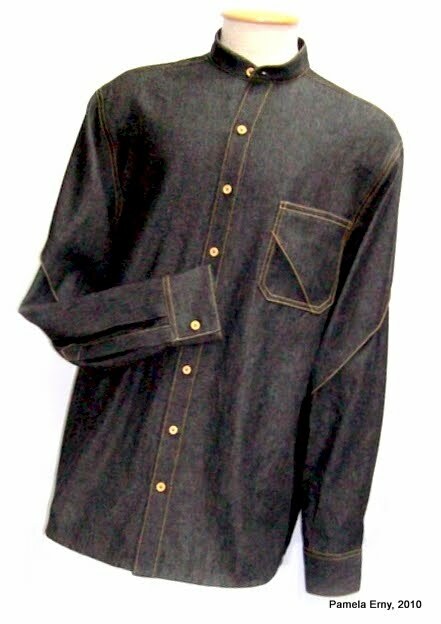 And speaking of shirts...as I promised in a post way back on December 13, I will finally be starting to sew my version of the Collette Patterns Negroni Shirt later this week. Though the pattern comes with an excellent set of instructions, I will be refining some of the steps along the way for a more professional finish. I'll snap some pics along the way, so you can see what I am dong a bit differently, and why...so stay tuned. I have kept quiet about this new Etsy Vintage Pattern store long enough to scope out several pattern that I wanted for myself...so now I'll share ;) CoudreMode Vintage Patterns! Phyllis, the shop owner, is a third generation sewist, (and one of the original Sewing Divas) now selling many of the patterns from her own personal collection and those of her mother and Grandmother. There are patterns in her shop dating from the 30's to the 80's....really lovely styles! (NAYY...though I do "know" Phyllis as a 'sewing friend'..and am a big fan of her sewing and fashion blog, CoudreMODE ).